Tv. A lifesaver? A sanity tester? A parental indiscretion? I said Leo would never watch Tv. Pre-mum me said so many things. Three years later the screen became my single parent backup. My savior on THOSE DAYS. You can distract a biscuit covered, wailing offspring with Mr Tumble and they will instantly be entranced. After four broken hours sleep, I couldn’t care less if the high pitched, happy singing was irretrievably effecting my littles prefrontal cortex. Mummy was blissfully, bloody glad of the silence. She had ten minutes to cry in the bathroom and tell her pale reflection she could do it, and was doing well. Does anyone actually know what Mummy Pig does for a job, why the Teletubbies look like Oompa Loompa’s who got it on with colourful coat hangers? And why Doctor Ranj has such giant, impeccably groomed eyebrows? Did anyone else start to find Mr Bloom disarmingly attractive whilst singing to pretend vegetables in his tweed hat? Just me then. Your offspring would watch TV all day if you let them. And sometimes, you consider it. Songs, colours and smiles. Creepy smiles, that are too wide. CBBC presenters take Prozac. And none of them have children. This is not a debate. I refuse to feel bad, am tired of apologising for everything. Dora the explorer is not telling my child to take drugs, play with knives or set fires. I do not advocate for letting tiny tots watch seven hours a day, but do for some latitude on having five minutes of Sesame Street for a precious parenting asset: a few minutes. A few minutes make me a better mother, to breathe away frustrations. To put dinner on, to hold him close, snuggled on the sofa. 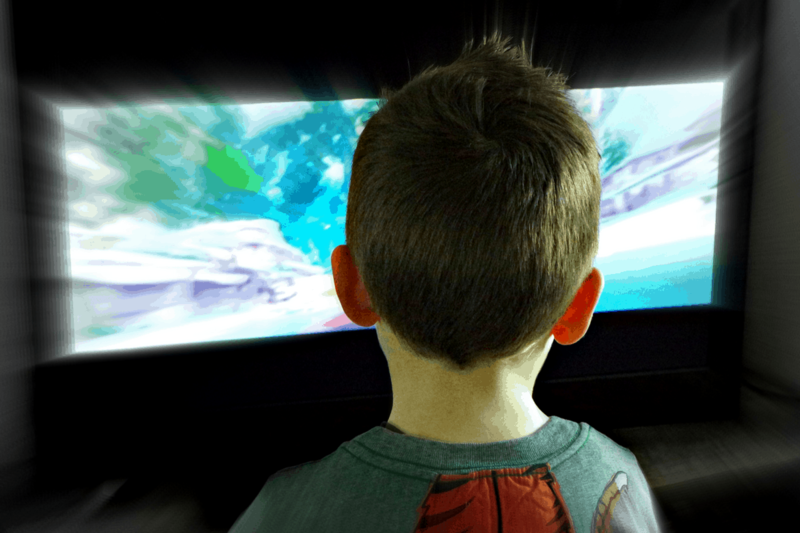 Tv is no longer a distraction since my son turned five. Currently it’s all about Madagascar in our house. We have seen it 543 times. I actually now believe Ben Stiller is a lion. Madagascar, approximately an hour of Leo constantly talking to himself, the Tv, anyone within a hearing radius. He will pause for breath….then continue the high pitch waffling. He will then pause again to regroup and stare at the screen for five minutes without blinking. I wonder whether I should prod him and check for signs of life. The chatter resumes. Louder. And faster. “Mummy did you see that? Oh my goodness! My few minutes have been replaced with a barrage of questions but I love his curiosity. Are you torn between Tv and no Tv? Sitting weighted with guilt because you put it on for ten minutes. Don’t. TV doesn’t have to be your first choice. Supervise what is being watched, regulate watching run in the garden when it is sunny. If you watch CBBC when your kids not in the room, you have probably lost it. Disclaimer: Before any outraged troll typed wish to berate me for letting my offspring watch TV…we watch a programme every few days. And, we own wellies. We don’t watch Criminal minds. Guidelines are taken seriously, but we live realistically. What I your opinion of the big talking box? For, against? Do you fancy Mr Bloom too? omg! I also had one addicted mr tumble lover but…..wait till your kiddies get iphones/ipads…..addicted is not the word!! however mummy pig here gets to cook tea, prepare lunchboxes, sort the mail and clean up…mmm…tv is now soooo oldschool, she hardly watches it! The tv is definitely a sanity saver in this house, but like yours, my son never stops taking or asking questions all the way through. I don’t think a bit of to does them any harm as long as they’re still doing other things and staying active too. In fact, some programs can actually be quite eductional. My 7yr old has recently become fascinated with nature programs after we let him watch the latest Planet Earth series, and weirdly loves Who Do You Think You Are for all the history. we try to keep a limit on tv time and survey what they watch when they do .